Finally You Can Easily Create Professional-Looking Intro Videos in Seconds! They're going to think that you became a Video Guru overnight, no problem, we'll keep the secret! Intro Video Creator is an Adobe Air software that creates Logo Stingers. It creates Intro Videos using 2D and 3D animations, the fonts and background can be easily customized. It allows to add MP3 intro tracks and the final video is exported as MP4, ready to be merged to any video, used on presentations or sell it. Of all the Video Making software I've helped to bring out to the Marketplace, Intro Video Creator, is the easiest to use!" Forget about expensive software or designers charging you a fortune to animate your logo. Intro Video Creator is the easiest and most affordable solution on the market to create Logo Stingers in Seconds. We understand that your logo is part of your identity, that's why we developed Intro Video Creator in a way that allows you to customize all the elements around the Intro Video (Fonts, Background Color, Gradient, Music). Some 'other' more expensive software are limited to give you a video file. 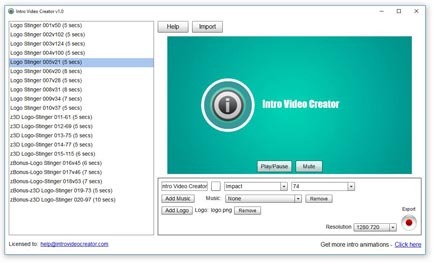 Intro video Creator allows you to add your OWN Music background on the final intro video or you can choose an Intro Music track from the included Intro Music Menu. We know that you want to match your logo colors and marketing material with your Intro Video. That's why we added the option to change the default background colors and to make it even better you can customize the gradient color and angle and preview it in Real-Time, before you create your Intro Videos. Some 'other' tools on the market make you wait ages, a long, long time to generate a video. Intro Video Creator rendering engine is one of the most powerful and fastest on the market, so you get Amazing Intro Videos done in SECONDS! We know you don't want to waste time learning how to use a new software. We designed Intro Video Creator in a way that makes it easy and intuitive to use even for a child (tested with our kids), so you can save time too! Just choose your favorite Intro Video Template (Logo Stinger). You can preview them in Real-Time. Just scroll down or use your mouse to choose from the left menu any of the included animations. You want variety, that's why we included 2D and 3D animation and not only 3D like some 'other' tools on the market. Now you can match your brand image to your intro video easily by choosing between 2D or 3D Intro Video animations. The next step is easy too. Just click on the ADD LOGO button and add your logo, please use a transparent PNG image. Once Added you will see in Real_Time your logo on the selected intro video template or if you want you can choose any other Intro Video Template and your logo will be previewed there too. We know that you want to match your brand colors with the final video. That's why we added the option to customize the background color and the gradient of the Intro videos. The best part that yo ucan go as far as choosing the lighting angle of the gradient! Finally you have the option to choose your video dimensions, 640x360 or HD 1280x720 or HD 1920 x 1080. After clicking the export button you jsut need to waitr a FEW seconds and your Intro Video Animations will be ready for you to use it in anything you want! The Adobe Air Software that works on PC & MAC and creates amazing Animated Logo Videos (Logo Stingers) in Seconds. 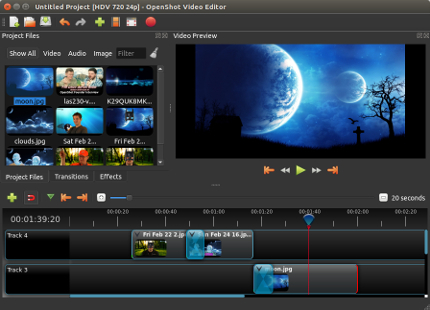 You are gettting 8 2D Intro Videos & 7 3D Intro Videos. 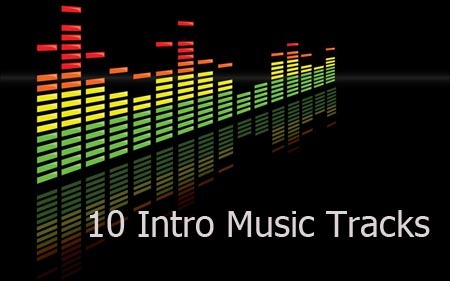 You are gettting 10 Intro Music Tracks to use on your Intro Video Projects. That's $327.00 in Total value! For The Price of a Couple Of Pizzas, You can get the NEW Intro Video Creator! *Only 4 units left at this price! Hurry up! 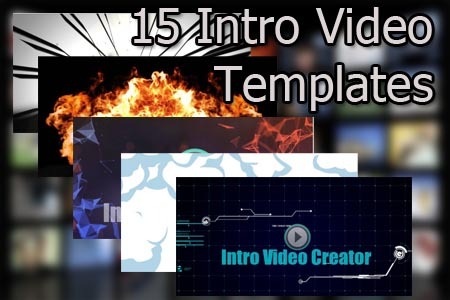 Intro Video Creator is so easy to use and the video creation speed is swift as lightning!" Yes! it works on MAC and PC. We developed Intro Video Creator with ADOBE AIR. It is very easy to install it and use it. Can I sell these Intro Videos? How can I Merge these Intro Videos to other videos? 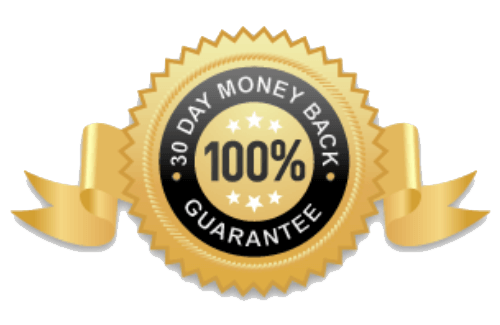 We're including in the bonuses a link to a FREE Video Editor (very easy to use) and a training video that explains you how to do it in seconds!. After purchase you are going to get an email from LicenseEngine.com with your LICENSE. Please check your spam folder if you don't see it. Another way to get your license is by using the JVZOO Transaction ID, ie: 'AP-XXXXXXX', then your license would be 'XXXXXXX' Just remove the 'AP-' bit. What kind of logo can I add? Yes! 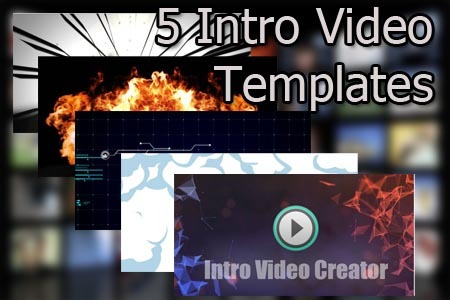 it is very easy to use, just 3 easy step, 1. choose your intro video template, 2. Add your logo, 3. Click on the Export button, done, you have your new video. You wont, but if for any reason you do, just contact support: help [AT] introvideocreator.com and tell us what is wrong, we will do our best to help you. How can I IMPORT more Intro Videos? 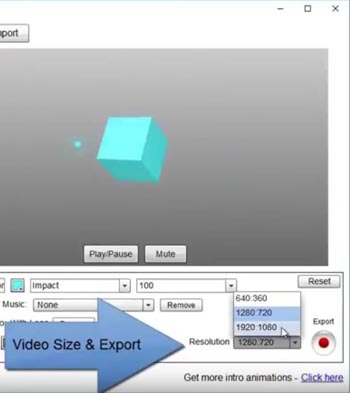 Just click on the IMPORT button on the software and add the ZIP file with the NEW Intro Videos.